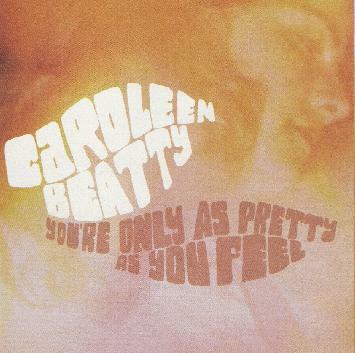 Caroleen Beatty - "You're Only As Pretty As You Feel"
Though this is vocalist Caroleen Beatty's album, I'll grab Aural Innovations readers attention by letting you know from the start that the backing band on this collection of cover songs is Mushroom. And if you enjoyed Mushroom's Mad Dogs & San Franciscans album, where singer Gary Floyd joined the band for covers of 70's classics, then you're sure to like this collection as well. Many of you may already be familiar with Caroleen, as she was the vocalist on the Brian Eno Taking Tiger Moutain tribute CD from a couple years ago. Caroleen really captures the pure soul of the original on her cover of Bill Withers' "Use Me". The music conveys a great jazz-funk feel, and has that ethereal psychedelic quality that only Mushroom can do in the jazz realm. "Sally Go Round the Roses" is next, and while the credits refer to the Pentangle arrangement, a Google search revealed that the song was originally recorded in 1963 by The Jaynetts. And besides Pentangle, the song has also been covered by Tim Buckley, Donna Summer, and others I'm sure. Another cool grooving tune with a great jamming feel. LOVE that organ sound! "The Flesh Failures" from the Hair soundtrack is a real standout (you know… "Leeeet, the sunshine… leeeet the sunshine in"). It's got a fantastic trippy groove and more jamming from the band. Ditto for the totally trippy "Pretty As You Feel", on which Caroleen out slicks Grace, and Mushroom drummer/band-leader Pat Thomas provides the accompanying vocals. The CD wraps up with a totally Mushroomized cover of the cool grooving "Toady", originally recorded by Ginger Baker's Air Force. At nearly 8 minutes the band really stretches out, with great jazz piano from Brian Felix, accompanied by cool flute and sax, freaky guitar bits, and a groove that's to die for. This one gets my vote for best of the set. In summary... outstanding, and by no means a mere set of cover songs. Anyone who knows Mushroom will know what I mean as regards the music. And Caroleen's soulful voice does genuine justice to these songs. If you have a passion for 60's/70's rock/psych/jazz/soul, you should check this out for some fresh interpretations of these classics. The only disappointment is that the CD only includes 5 tracks and is barely 30 minutes long. Maybe Caroleen has a full length up her sleeve? For more information you can visit the Caroleen Beatty web site at: http://www.caroleen.com. Email Black Beauty Records at: blackbeauty989@hotmail.com.